Corks have a story. We may associate them with a vacation or a special occasion, Wineries make choices to display images, names, saying, regions, phone numbers, websites, and more. In terms of corks, all wine corks are not created equal. This is a small cubby in our lower level. The angle on the upper left is the stairs. Some in our neighbors have a wet bar in the space, but we went with just the counter. This past January, my wife showed me an interesting image from Pinterest. I suggested we could do that in the lower-level cubby. After researching possible designs on Google Images, ideas were racing through my mind. The key question was original free-form/abstract or uniform? Measurements and calculations allowed me to estimated the need for 1050-1100 wine corks (if corks occupied the entire space). After the easier-than-expected collection phase, I began designing. My initial thought was to put together a variety of designs on the mock-up to see what we liked and disliked. But, as I got going, I changed and tweaked as I progressed. A few weeks later we were in a new restaurant for my birthday, and we saw several cork designs – and my wife liked a particular uniform design. Because I had so many corks, I created a second mock-up (in about 40 minutes) so we could compare. During my cork collecting phase, I got an idea that friends thought was crazy. Whereas people were shocked to learn that I was on the prowl for 1000 corks – but then I told them I changed my goal to 1000 different corks – and no plastic ones. With two prototype designs completed, my wife and I preferred different designs. While she found the eclectic design too busy, I found it easier on the eyes. Whereas she liked the uniformity of second design, it was a blurred to my eyes. So the challenge became to create something relatively uniform to fit her taste, yet be easy on my eyes. As for the actual construction, first step was cutting a piece of plywood to fit the back wall. This would serve as a surface for mounting the corks (as opposed to attaching them directly to the wall). All the advance work led us to cover the plywood with cork shelf paper. This could help add depth to our design. The actual construction was a slow process. After all, in most cases, we glued the corks individually – most of the 800+ one by one. We did most of the work on a table. After attaching the board to the wall, we completed the project. Voilà! 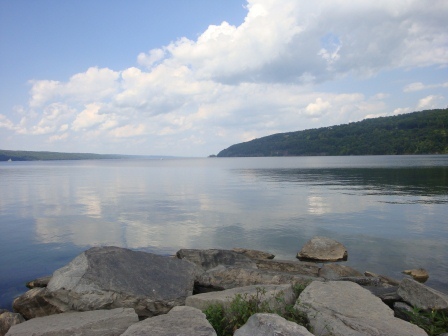 The Finger Lakes region is in central New York, far from the hustle and bustle of New York City. On the map, there are a series of long, narrow, parallel lakes looking like fingers, which are actually very deep. 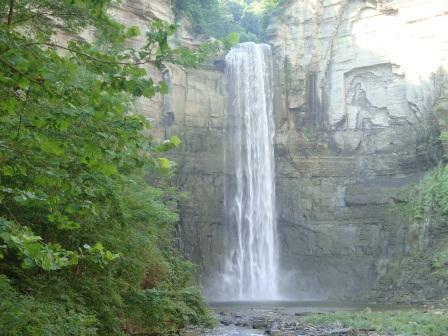 For many years I’ve heard of people vacationing to the Finger Lakes region – but the urge to go never overwhelmed us enough to act on a trip. Given last year’s change of address, 2014 turned out to be a good time for a driving vacation. As people who enjoy the fruit of the vine, wine was our primary focus. Although known for many years for its sweet, low-cost wines, todays Finger Lakes winemakers produce very respectable wines. Anyone expecting hardy reds will be (for the most part) disappointed. Reds as Cabernet Franc and some blends are good, but far from the deep, rich reds from California or Washington. Riesling is king of grape in the region. Although I prefer a wide variety of red wines, Rieslings have captured my attention for a long time. 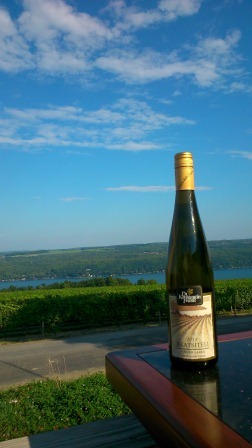 Similar to their Germans and the French Alsatian counterparts, Finger Lake winemakers produce Riesling in a variety of styles, which range in sweetness and dryness. Towns as Watkins Glen, Hammondsport, Seneca Falls, and others are small, but large enough to have restaurants, small hotels, and bed & breakfast inns. 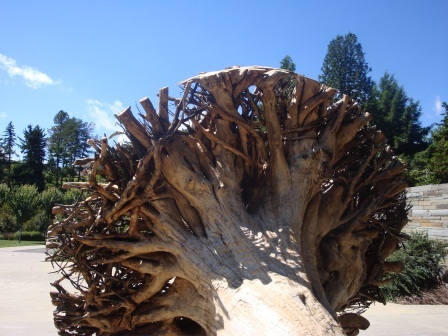 Besides wineries, the region also includes state parks, hiking trails, local artisans, and museums. 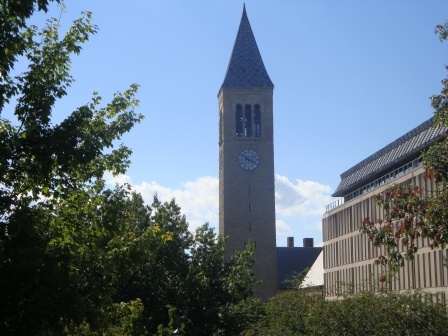 Ithaca is one the region’s largest cities (30,000+), and is home to Cornell University. 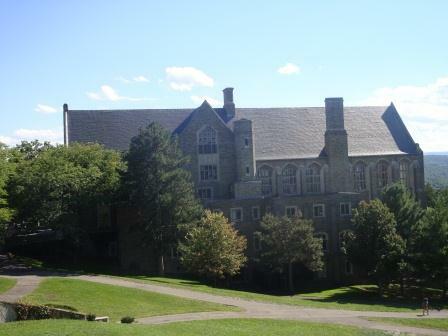 Because one of my Bucket List oddities is to visit all the Ivy League universities, we enjoyed the campus, the botanical gardens, and arboretum. 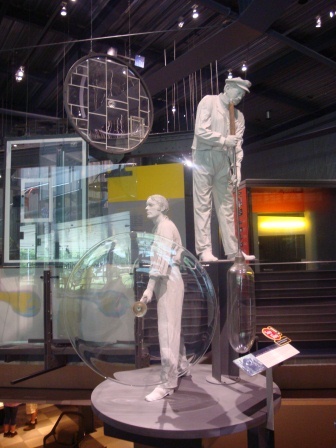 Corning (population 11,000+) is less than an hour away, and home to the Corning Museum of Glass. Our original itinerary didn’t include a stop, but to me, this was the biggest surprise of our trip. Simply fabulous! 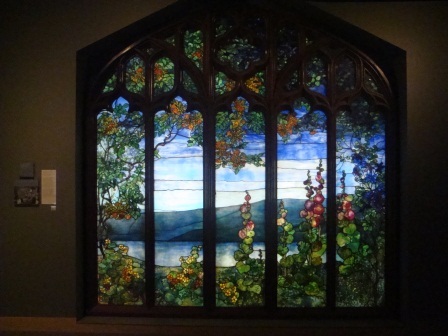 For readers in the northeastern US and eastern Canada, the Finger Lakes region is a worthwhile destination – so, consider it. I recall that day in December 2013. As my wife and I were returning from errands, I noticed a package on our doorstep … and we both confirmed that we weren’t expecting anything. But as I approached the box, my brain pulled out the file card with the answer, then I smiled and my heart rate increased in anticipation of what was inside the box. After all, I had never done anything like this before. I sent my name, address, and wine preference (red, white, or either) to him. After gathering the information from participants, his wife developed the plan … which meant I received a name, address, and wine preference of a person (and they don’t know it will be from me), plus someone received my information. So there it, inside the box on my doorstep … a wine from my Secret Santa. Envisioning a delight that would be a highlight to a dampened holiday spirit (as my mother-in-law had passed away a few weeks earlier), I was eager to open the box. Would it be a single varietal or a blend? Would it be from vineyards of Spain, Italy, France, California, Australia, or Argentina? As I reached for the bottle, my excitement continued to build, then like a ton of bricks … POW … I crashed when I noticed the wine was from a vineyard in Arizona. Where is the Arizona wine region? Given the location, a blend has to be better than a single varietal. I examined the bottle, and on the backside … YES … it’s a blend! Then I gave myself the wake-up call … Hey … wine lovers read Jeff’s blog, so they aren’t going to send lousy wine … so relax and trust the sender! Tom, my Secret Santa, included a wonderful write-up about the wine, the vineyard, and himself. He gave a quick overview of Arizona wineries (over 50) being at the high elevations (thus cooler) in primarily three regions of the state. In this case, the owner and winemaker is Maynard James Keenan, a metal/alternative rocker who has won awards with this wine. 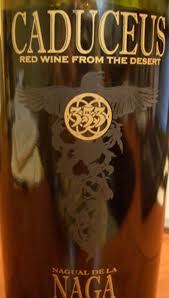 Caduceus (the winery) is also the staff carried by Hermes …. the staff that is the common symbol for medicine Winery’s homepage: Here’s what we discovered about this wine. Although this post is very late, I salute Jeff for organizing this fun activity (the rules), Theresa who received my wine, and Tom – my Secret Santa .. and hey Jeff … I hope you do this again. Here’s a short video of the winemaker discussing this wine. Cheers! Some associate tannin with leather, which a good thought to describe tannic red wines because tannin is what causes the dry feeling within the mouth – the pucker of dryness – the feeling like someone swabbed the mouth dry. Tannin is actually a protein group found through plant parts as stems and leaves – and in grape skins. It’s not something one smells, but its taste can also be found in tea, chocolate, herbs, and more. Yet, it is because of tannins that red wine goes so well with the fats of red meats and cheeses. Why are some red wines more tannic? There are numerous factors determining the tannin level in wine. Whether natural or from the winemaker, here are the key factors – and help with the understanding, let’s go through the winemaking process. (1) Grape Variety: Some kinds of grapes are naturally more tannic. For instance, cabernet sauvignon is more tannic than merlot. (2) Grape Maturity: Picking the grapes at the right time is important for optimal levels of juice, sugar, and tannin. In general, younger grapes have more tannin. (3) Vineyard: Although the vineyard itself is not a tannin source, the soil and conditions may yield a certain minerality that could enhance tannins taste. (4) Exposure Time: While white grapes only yield white wines, dark grapes can deliver red or white wines. 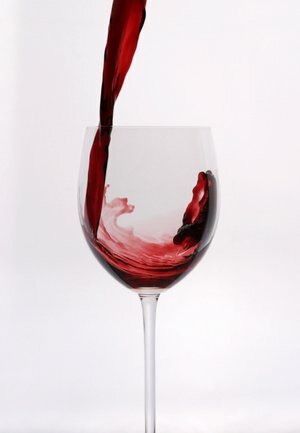 After all, the grape’s juice is close to colorless; thus, red wine’s color comes from exposing the juice to the skins. Regarding tannins, the longer the juice is exposure to the skins, the higher the tannin levels. (5) Fermentation: Fermentation is the process yielding the alcohol. Some winemakers prefer to ferment the juice in the presence of grape stems, skins, and seeds – which will yield more tannic wine. (6) Barrels: After initial fermentation, winemakers place many red wines into barrels. Because the barrel’s wood is from the stems of a tree, the barrels naturally contain tannin. Now, sub factors as the type of tree, the newness of the barrel, and the time spent in the barrel become important factors. (7) Additives: The winemaker may choose to add wood chips or tannin powder to the barreling process. Again, type, amount, and time are factors. (8) Age: Finally, the wine moves from the barrel to the bottle. Although many wines are drinkable, some need more time in the bottle than others – time allowing additional reactions to occur to tone down the tannins. A blending note: Labeling laws are different everywhere, California law gives the winemaker much latitude. That is, for a wine to be labeled Merlot, Cabernet Sauvignon, Zinfandel, or whatever, it must contain at least 75% of that grape variety. In other words, the other undisclosed grapes may in the bottle, but not on the label. Winemakers experience a lot of pain when determining the result in that bottle. They know consumers have different tastes. So, people asking their retailer for a smooth wine are actually asking for less tannin … so keep this in mind in your purchases. As this previous post establishes, Prohibition (1917-1933) decimated the American wine industry. Gallo produced jug and fortified wines to fit the market needs, but popularizing fine wines was still decades away. In the 1940s, Cesare Mondavi sold grapes, and later in the decade became a partner in two wineries. Interestingly, each son (Peter and Robert) got their exposure here. In 1943, Cesare purchased the well-known Krug winery. With Peter as the winemaker, and Robert focusing on marketing, they produced two labels: CK Mondavi (for quantity) and Krug (for quality). Cesare died in 1959, so his wife ran the company. They struggled, the brothers argued, and she chose Peter to lead a revival in 1965 – leaving Robert to be on his own. Robert’s became enamored with fine wines on a 1962 trip to Europe, thus he was now free to pursue his dream of making fine wine in America. In his quest to find start-up money, his public relations skills helped find supportive winemakers. His first harvest came in 1966. The winery’s tasting room drew tourists, and his brand became known. By the 1970s, Mondavi was leading the wine revolution in America – but it was still a country of inexpensive, jug wines. The story changes direction in 1975 when Stephen Spurrier (a British sommelier and wine shop owner in Paris) visits Napa Valley for the first time. The region was far from what we find today nonetheless, American wines caught Spurrier’s attention. The world finally recognized that fine wines were in America, and the dreams of Thomas Jefferson and Nicholas Longworth came to be. Americans also took notice over time. In 2006 (30 years later) Spurrier hosted another competition, and American wines won. Today, all 50 states have wineries. California still leads the way, but quality wines are also in Oregon and Washington – plus New York and Virginia in the east. Ironically, one of the wine regions is near Thomas Jefferson’s home. Jug wines remain popular, and Gallo (with its 60+ labels) is one of the largest wine producers in the world – and its stable now includes quality wines. Robert Mondavi died in 2008 at age 94, but sold his winery to Constellation Brands in 2004. According to the Wine Institute, the United States is sixth in the world in grape acreage, fourth in production, and is the largest global consumer of wine. As a wine lover, thank you Robert Mondavi for being a believer and tireless promoter of quality wine – and for leading the charge. Enjoy this interesting, quality tribute to Robert Mondavi. This is an abridged version of a story because they were many more events than these. It’s also part 3 of the series: Part 1 (the industry’s start), and Part 2 (the link between wine and temperance). For Part 4, the post following this one, click here. The end of prohibition was not a good time for the wine industry because most wineries closed, growers replaced wine grapes with domestic grapes, old equipment, and a lack of knowledgeable winemakers. So, reclamation for the industry would be years away – but two names would lead the way to fine wines in America – Gallo and Mondavi – but they will do it in different ways. Nearly broke, family members loaned two brothers $5000 to start a winery. With Ernest as the idea generator and marketer, and Julio as the winemaker, the Gallo brothers set their sights on returning wine to the America by producing wines for daily consumption through modern production methods. Going into Prohibition, 25% of wine sales involved sweet, fortified wines. Interestingly, following Prohibition, a sweet, fortified (high alcohol) wine actually led wine’s comeback. That’s right – a wine called Thunderbird, the one associated with town drunks (winos), was an early Gallo success! After all, they could produce it quickly and with low-quality grapes. Unlike Nicholas Longworth’s ambition of bringing culture to America through wine, Ernest had the knack of visioning new products for an untapped market, thus Julio developed the wine to meet those needs. Gallo ultimately achieved successful through names as Livingstone California Burgundy and Paisano. Popular labels as Boone’s Farm, André Cold Duck, and Bartles & Jaymes wine coolers helped grow Gallo’s profits. By the early 1990s, Gallo (now the largest winery in the US), one of every four wine purchase was a Gallo brand. At this time, to grow into finer wines, the corporation started purchasing land in Sonoma County. Today, after 75 years of wine making, Gallo wines remain a powerful force. With the children, grandchildren, and great-grandchildren of Ernest and Julio involved in the company, Gallo claims to be the largest family-owned winery in the world, plus the largest exporter of California wine. Grocery stores with large wine selections carry many Gallo labels, most of which consumers don’t know. After all, Gallo now offers over 6o brands/labels. Enjoy this report from NBC about Gallo.